SEGUIN, Texas – On Tuesday evening, city council approved an expanded, but more efficient route for the city’s public transit system. 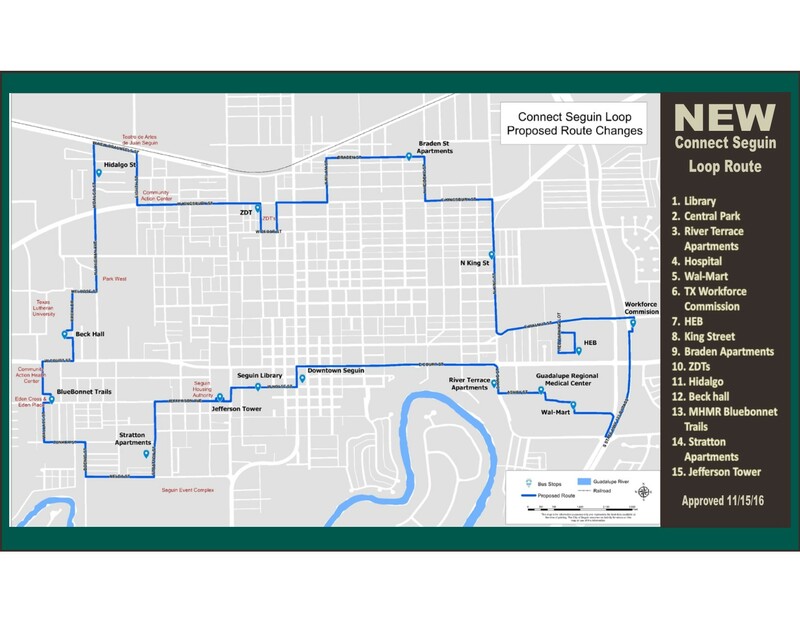 The Connect Seguin Loop provides a reliable, convenient and affordable way for citizens to get around town. To encourage folks to try the new route, free bus rides are being offered starting Monday (Nov. 21st) and will last through Black Friday. “The new route is a loop around town that hits major destinations like the new library, Central Park and shopping at HEB and Wal-Mart. We hope folks will take advantage of the free rides all week especially when they are out shopping on Black Friday,” said Morgan Ash, Public Information Officer. Shoppers looking for hot deals on Black Friday can save even more money when they hitch a free bus ride on Friday, November 25th. Bus stops are convenient to many area shopping spots like Wal-Mart, downtown boutiques and Beall’s. The proposed changes came about after the city sought ways to increase ridership to meet the previously set 50 riders per day goal. Through this process, staff became aware of inefficiencies in the route, it was too long and the bus was unable to meet time scheduling as designed. Staff feels the new route is easier to understand and will make it easier for folks to use the system to get where they need to go. Alamo Area Council of Governments operates the Connect Seguin bus route and feels the new route will allow drivers to get through the entire “loop” in an hour. Three new stops being the Seguin Public Library along Nolte Street, Central Park, near the corner of South Austin and East Donegan Street and ZDT Amusement Park along North Bowie Street will be implemented. The new Connect Seguin Loop bus route will be implemented on Monday, November 21st.